The career of Kensington-born midfielder Len Oliver reads like a listing of the great Philadelphia teams in the 1940s and 1950s: Lighthouse Boys Club, Fairhill SC, Philadelphia Nationals, Temple University, and Uhrik Truckers. Oliver continued to play club soccer after being drafted into the Army and eventually was on the US 1963 Pan-American and 1964 Olympic teams. After his playing career ended, he began a long career in coaching and is now on the board of directors of the DC Stoddert Soccer League and a staff member with the Virginia Youth Soccer Association. He was inducted into the National Soccer Hall of Fame 1996, the Philadelphia Oldtimers Hall of Fame (now the Southeastern Pennsylvania Soccer Hall of Fame) in 1998, and the Virginia-DC Soccer Hall of Fame in 2001. Oliver has kindly given SASH permission to republish in serial form an article he wrote in 1992 for the Michigan Ethnic Heritage Studies Center ‘s Journal of Ethno-Development originally entitled “American Soccer Didn’t Start with Pele: Philadelphia Soccer in the 1940s and 1950s” in which he describes his memories of playing soccer in Philadelphia. It’s the best account of the game in Philadelphia at that time that we’ve ever come across and we are honored to share it as a series. Each part of series will be followed up with a Q&A with Oliver, truly one of Philadelphia soccer’s all-time greats. My earliest soccer memories were watching my father play in the late ‘30s and kicking a ball in the streets with my twin brother, Jim. I remember above all the pungent smell of liniment in the changing rooms for my father’s teams–they had no locker rooms, just places to change–and hanging around with Jim as our father prepared for a match with his German-Hungarian Club. 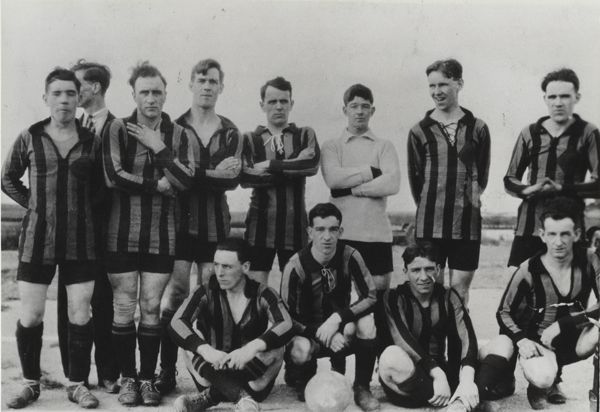 The “Hunkies,” an outstanding amateur soccer team in late ‘30s in Philadelphia, were no different than the other ethnic clubs that dotted the Philadelphia landscape in this period. They were the immigrant Scots on the Blue Bells, the Germans with the German-Hungarians, the Irish playing with the Celtics, along with trade union-backed teams like the Bricklayers and Hosiery Local, or corporate teams such as Bethlehem Steel and Fleisher Yarn. Ethnics dominated Philadelphia soccer, although Philadelphia nurtured a sizable number of home-grown talent. My father was a blur in his red and black jersey–running, passing. tackling, yelling-a 5’7” pesty Scottish center half moving up and down the field under the traditional 2-3-5, soccer’s mainstay system since the 1870s. And he seemed to be always full of mud. Jim and I shared oranges with the players at halftime, sometimes kicking a ball with a sympathetic player. These early experiences created an accepting, pleasant soccer environment for us. But beyond the liniment, the ethnic clubs, and the post-game parties where someone was always good for a soda, we had the streets of Philadelphia’s Kensington area where we grew up in a working-class neighborhood of red-brick row houses on a tight little street. Helen Street was our playground, a garage door our goal. Streetlights and curbs were merely additional obstacles to be overcome. We went 1 v 1 for hours on that street, joined occasionally by cousins and neighbor kids for 2 v 1 or 3 v 2 games. Time skipped by and 25-20 was not an uncommon score. We always kept score in ”street soccer,” building in an early and not-to-be-forgotten competitiveness. We invented ways to take each other on without instruction, now called “self-teaching” by the licensed coaches. We also fought with each other and with neighbor kids. Our father, a former amateur boxer in Scotland, had taught us to use our fists when we were five years old: “If you’re going to play this game, you have to know how to fight,” words reminiscent of an earlier era of rough-and-tumble ethnic soccer. But whatever we did with the ball on Helen Street, we learned the rudiments of soccer techniques and tactics with tough, challenging opponents, inventing moves as we needed them. We shielded, overlapped, changed pace and direction, jockeyed, executed wall passes, and nutmegged each other without ever hearing the terms. Occasionally our father would join us, but the long hours of work during World War II took him away most of the time. He did find time to train the Blue Bells, and our joys came in getting a used ‘T-Ball,” as they were called then, a bloated leather, misshapen bladder-filled ball that rolled in curious and unpredictable directions. We could depend on a hand-me-down pair of Hotspurs or Mansfields once a season, soccer shoes with high tops, steel toes, and replaceable nail-in leather studs. When our father brought home a torn Blue Bell white-and-blue striped jersey, we fought over it to decide who would be “the big player” that day. This wasn’t used equipment–it was new for us and helped us to identify with the older players. How difficult it is to explain to young players today, including my daughters who were good players, how we felt about these clunky old shoes when they thought nothing of paying out $100 or more because they liked the purple and yellow stripes on the shoes, or $60 for a slick, imitation leather ball that never loses its shape. We loved the game in the streets. Adults were not around to teach us the Coerver techniques or tell us to “Lock your ankle.” And when we wore those clumsy Mansfields we moved our 1 v 1 to the 100-year-old abandoned Franklin Cemetery down the street where tombstones became our goal posts and the winos our spectators. We especially looked forward to seeing the pros, usually at Cambria Stadium at Torresdale and Kensington Avenues as it was on the trolley line and we could see the Philadelphia Americans take on the Brooklyn Hispano or Ponta Delgada of Fall River. Our heroes were “Lefty” Mervine, Philly’s superb left halfback, or “Dutch” Christian, a sturdy right fullback and a great sportsman, or “Duke” Nanoski, the peppy center forward now in the National Soccer Hall of Fame. The name that sent murmurs through the crowd and excited the kids was Billy Gonsalves of Brooklyn Hispano. Gonsalves, often called the “Babe Ruth” of American soccer, was a dominating center-halfback who stood at 6’2 and came in at 210 pounds. After watching the imposing Gonsalves direct traffic in the midfield or drive powerful shots from 35 yards out, we returned to Helen Street to imitate his moves. Later on it was Walter Bahr and Bennie McLaughlin of the Philadelphia Nationals who became our idols, two of the best American-born players of the era. Opposing players who stayed with us were Jackie Hynes with the New York Americans and John “Clarkie” Souza of Fall River. I recall watching the balding Souza dribble three opponents on the Philadelphia Nationals’ old home field at Holmes Stadium on Erie Avenue, go for goal and suddenly step over the ball, heel it to change direction, and completely befuddle his mark as he drove the ball into the far corner. I worked on that move for weeks until it became part of my own repertoire of dribbling moves. Always emulating, acting out what we had seen–something so desperately needed on the pro scene in soccer today for the youngsters coming up and seeking their own heroes. By the time we were nine years old, in 1942, we were ready for formal teams, which in the Kensington neighborhood meant the Lighthouse Boys Cub soccer program, the famed incubator of youth soccer in Philadelphia since the turn of the century. We also played American football and baseball, as good American kids, but given our choice, we were always drawn to the streets and our soccer ball–our natural element. Hi my grandfather played then too. Lefty Mervine. If you knew him and If you have any stories about him I’d love to hear!